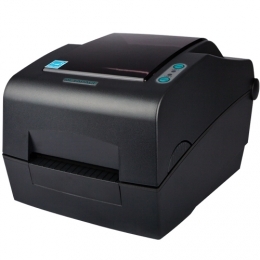 The Metapace L-42T offers high-performance label printing in a desktop format. By thermal transfer printing the labels they are longer lasting and suitable for applications in which labels are subject to more stress for example, in heat, outdoors or for long-lasting labels. The fast 400 MHz processor and 64 MB DDR2 RAM make even complex labels such as with pictures, graphics, 2D barcodes or particularly long labels, which are printed without delay. For easy integration into existing systems there are a variety of connection options, as well as high compatibility with existing printers ZPL, ZPLII, EPL and EPLII are integrated. The L-42T comes with parallel, serial and USB interfaces from the factory. Optionally receive the L-42T with integrated Ethernet print server instead of the parallel interface. Using a USB dongle you can even realize with this version 802.11 b/g/n Wi-Fi connections, which opens up a wide range of applications. Benefit in the most varying of applications from the L-42T in logistics, production and retail alike. Despite its compact desktop housing it contains an extremely large stock of consumables. Load it with up to 300 m long colour ribbons, as well as label rolls with a maximum diameter of 130 mm. This minimizes the frequency of material changes, maximizes uptime and increases work efficiency and ergonomics in everyday use. With 8 dots/mm 203 dpi the printer produces razor sharp images, whether barcodes, text or logos. Optionally available is a version with 12 dots/mm 300 dpi, giving you even higher quality print results. The L-42T processes media in widths from 25 to 116 mm, because you adjust the roller guide completely variably. The replacement of consumables takes mere seconds just open the lid, insert a new roll, close the cover and press the feed button calibration is carried out automatically. The printer reliably recognizes different label sizes and shapes, such as round or oval labels, via Black Mark and gap sensors, as well as automatic media detection.